Busy Monday: May Giveaway Day!!! 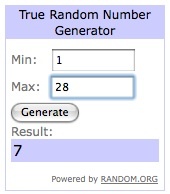 The Winner is # 7 ( A Joyful Chaos) as chosen by the random.org generator! I really appreciated all the entries and esp appreciated all the blog feedback. I'm wanting to make some changes - nothing too drastic - but changes none the less and love getting the opinions from all of you readers (even if you've only just found my blog). I do hope you'll come back soon! Thanks again! And congrats A Joyful Chaos! Good Morning kid giddy readers! It's May giveaway day! Are you excited? So am I!!! 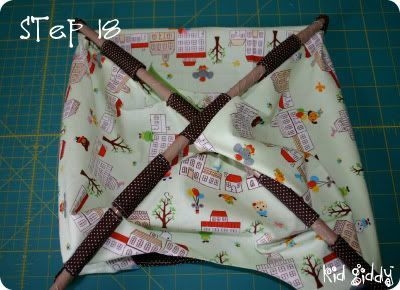 Every year I have found out about this Sew Mama Sew giveaway day...the day after, and therefore couldn't participate! It was always such a bummer...but this year - I'm on the ball and I've got a giveaway for you! I'm done asking people to "follow my blog" just to be able to enter. I don't think that makes for a true follower! I've had my followers number go up by one or two only to have the number go down by the same amount a day or two later. I think people just follow for the sake of getting a freebie and then are no more loyal than before they found your blog. I'm not pessimistic, it's just reality! lol! Don't get me wrong - I would love more followers because who ever in their right mind wants to feel as if they are talking to a wall?...so if you feel so inspired - click the button - it would be much appreciated to get to know all you fellow crafters and likers of my work! What do you like most about my blog and is there anything you would change if it were yours?! ReTweet about my giveaway, with @kidgiddyetsy attached to your tweet. If you are the lucky randomly chosen winner...this is what you will get....1 little doll that measures about 8" tall in a handmade sweet baby blue blanket with little white lambs dancing through the grass. 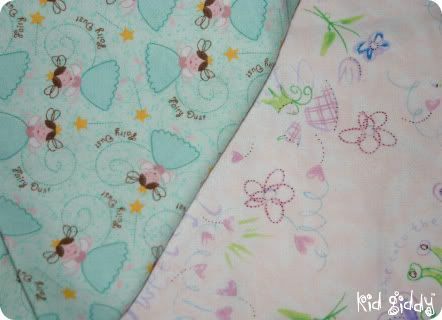 Perfect for a little girl or boy ready to share some love! 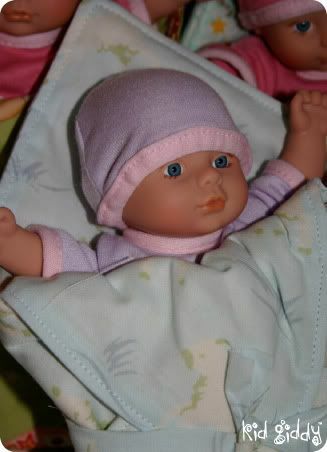 The removable outfit is purple, and the eyes are blue, but I do have one with brown eyes. So you can request the blue or the brown eyes...in your comment (more baby doll sets will be available in my etsy shop soon!) This doll is ready for some baby cuddles and play time. 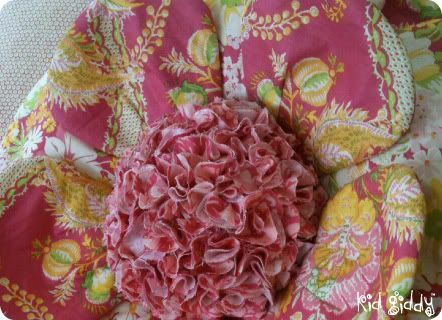 The lucky winner will also get (1) 14x14 kid sized pillow with 2 handmade envelope pillow covers! 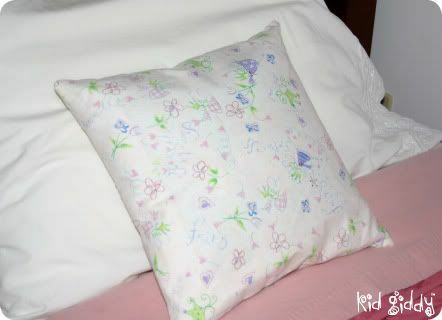 My girls started using these perfectly sized pillows for bed time when they were about 2 years old. They are 8 and 6.5 now and still use them since adult pillows are just too big! 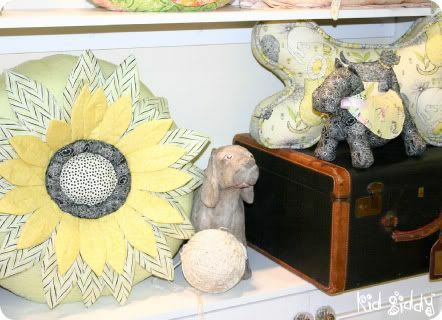 They are a great size for traveling and for snuggling up between mommy and daddy on Saturday morning! These prints are both fairies. If you would prefer a boy print - let me know and I'll see what I've got in stock! Please let me know if you have any questions...Good luck and thanks for visiting my blog and entering my giveaway! This giveaway will end at 11:59pm EST on May 26th. One correct answer winner will be chosen at random. I will contact the winner via email so please be sure to leave your email in the comments below! The winner will be announced on Saturday May 28th. My HUGE News....Anna Griffin Sewing Patterns...by ME! 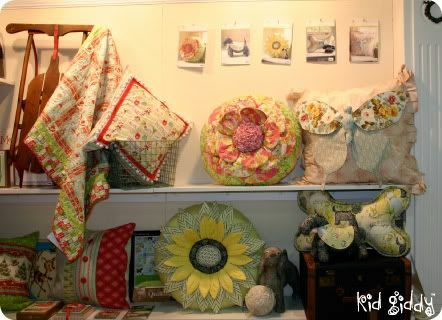 So It's Tuesday, two days after a very amazing and very long Spring Quilt Market weekend. I slept much of yesterday after dropping my girls off at school, yet it didn't seem like enough when it was time to pick them up. I'm still very sleep & family deprived after many months of working my tail off since attending the Craft & Hobby Convention in LA. 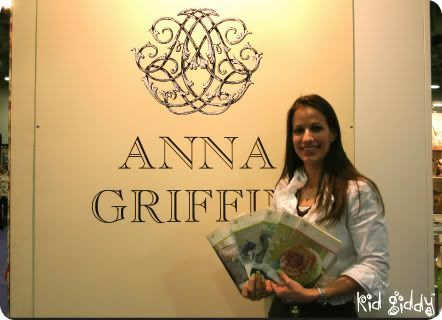 I still haven't finished recapping that weekend - since I started working immediately for Anna Griffin, Inc.! But I will soon...really! Did you read that?...that I worked with Anna Griffin? So here's the big news. I approached her booth at the CHA convention and spoke to her Communications Manager (love Lindsey!) and explained what I do and that I would love to work with Anna. I asked that she come to visit my Designer showcase table the next day if she had time and much to my surprise, found Anna approaching my table that very next day. 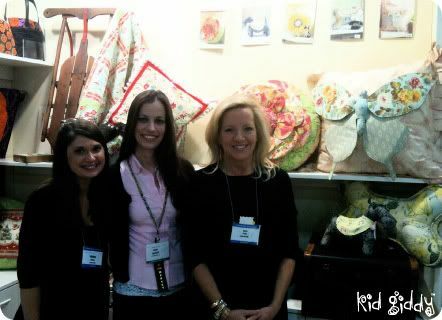 She loved my work and we immediately began talking about some opportunities for the Spring Quilt Market. It was a very intense and very rewarding opportunity to work with Anna Griffin and all of her wonderful people (like Lindsey and Holley)! This is just the beginning. I have more great stuff to tell you in the future - but again...it's all under wraps for now. You'll be there first to know (aside from my close family) when the cat is out of the next bag! 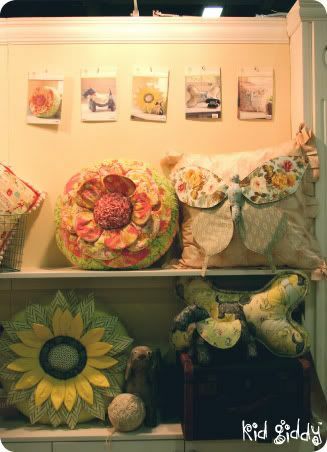 So here are some Anna Griffin, Inc Sewing Patterns that will be available in a quilt shop near you (designed by me) come mid to late June....The Scotty Dog with his cute little cape, The Bone Pillow, The Peony Pillow, the Sunflower Pillow and the Butterfly Pillow! What's even more awesome than all of this...is that when they come out - you can come back here for a chance to win a pattern for yourself! Anna has given me permission to give some to my readers! 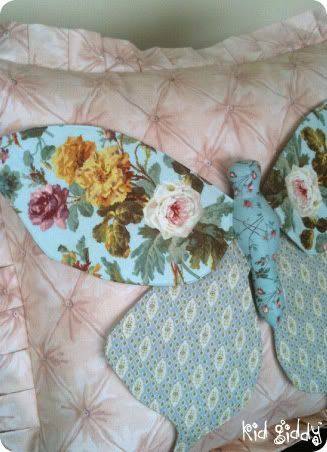 And I just might have to throw in some of her gorgeous fabric that I have remaining! So what do you think? Do you have a favorite? Please do tell! Thanks for stopping by - thanks for reading Kid Giddy and sharing in my joy and accomplishments! This little man stands out in the pretend rain and calls for something. I'm not sure what he's saying. I don't know where it's from and who's it was. I don't even know if he has a name. 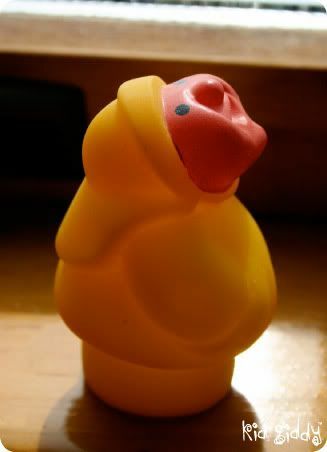 I found it about 20 years ago, buried deep in the sand on a beach in Long Island NY and I've kept him all this time in a little box filled with other small trinkets saved from the fun summers during my High School years! Isn't it so strange the things we save and the things we remember about them!? And amazingly the things we forget without the physical evidence? This little guys was too cute to leave behind. 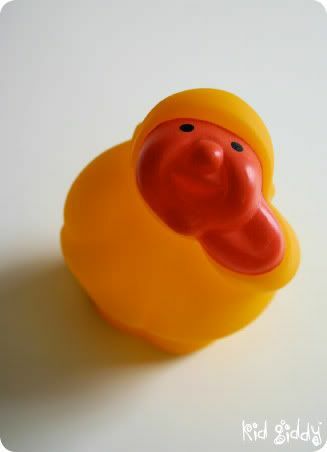 I feel sorry for the little tike that most likely lost him. What have you held onto? Do you have any fun treasures sitting in a box, in a deep dark a closet waiting to be re-discovered? Share it with us! Happy Thursday! I hope you all have a great weekend! I'll be posting my great big HUGE news next week! Keep your eyes opened and come celebrate with me! Good Morning everyone! Some of you are visiting my site for the first time - welcome...and thanks for stopping in! 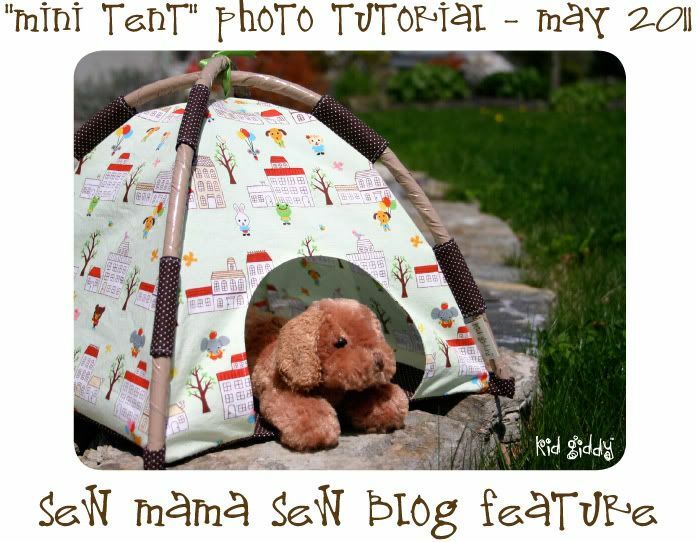 I've created this fun Mini Tent Pattern and it's being featured on the SewMamaSew blog today! I'm so excited to be a part of it now! Thanks Kristin and Beth! 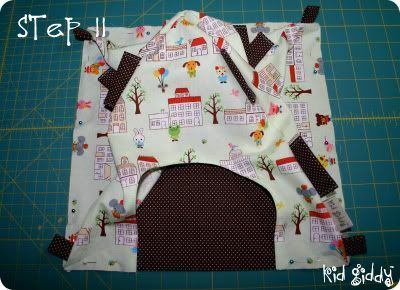 (Edit - It's Jan. 2014, I'm finally adding the pattern and tutorial to my blog). Download the template by clicking on the image. Pre-wash and press all of your fabric. This will be completely washable if made with cotton, and pre-washing will prevent twisting and tugging later on. 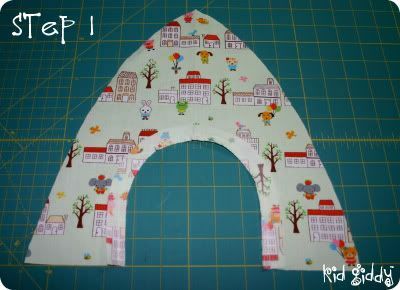 Use all 1/4″ seam allowances, except on top stitching. Trace pattern pieces (click image above) onto your pattern paper (connect the red and blue line for the tent sides). This is the only way it would properly print on a standard 8 1/2 x 11. BE SURE TO PLACE PIECES ON THE FOLD AS DIRECTED. Cut out all of your tab pieces (there are no pattern pieces for these). 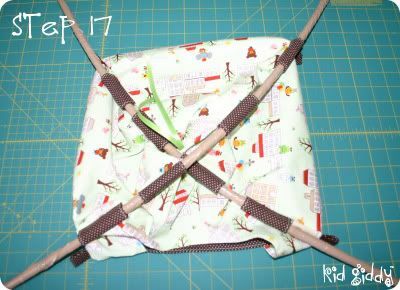 The tent pole tabs can be a combination of two fabrics, you choose, while the corner tabs are only one fabric. 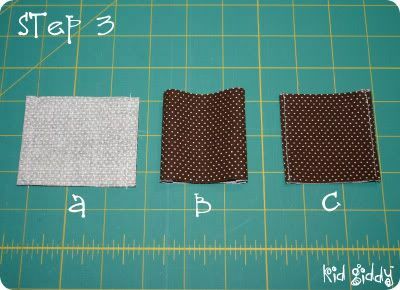 Pin the pattern pieces onto your fabric and cut your fabric accordingly. The tent flooring square should be cut to 11 1/4 x 11 1/4. You can cut more doors out of the side panels if you wish, just be sure to cut additional door frames too. Step 2: Press the frame to the inside of the tent, and top stitch that same seam. 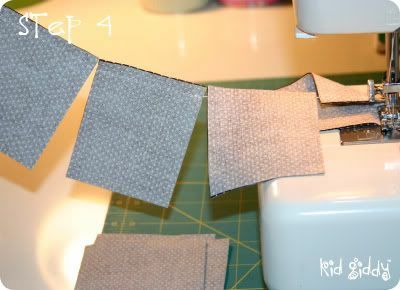 Step 3: Sew your Tent pole tabs together. 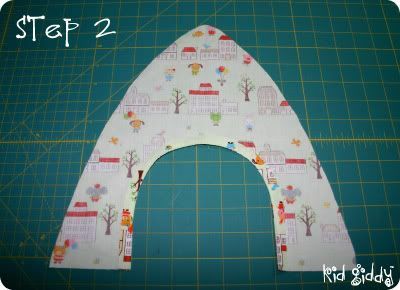 Place two pieces, right sides facing together and stitch both sides (a). Turn each piece inside out and press (b). Top stitch the side seams (c). The top and bottom are open, but they will be sewn into the tent panel seams so it’s OK. Step 4: The image just shows that you can save time by running each tab in a continuous “running stitch.” You still need to lock in your beginning and ending stitch on each so they don’t tear apart when turning. 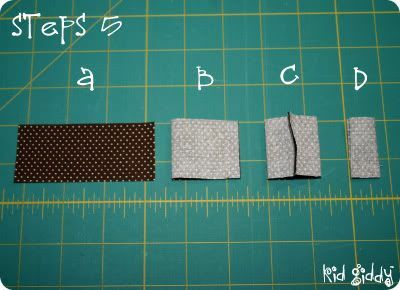 Step 5: Sew your corner tabs together. Lay a piece right side up (a). 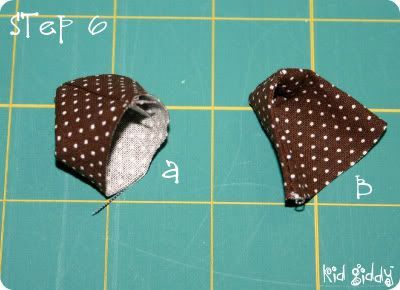 Fold that piece from left to right and stitch the right seam (b). Center the seam (c), and fold the sides together so the center seam is tucked inside. Stitch only one end closed (d). Step 6: Carefully turn the corner pieces inside out. Find that center seam (a) and pull it over to one side. 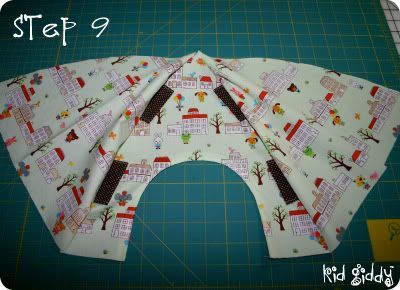 With a little wiggling, the corner will naturally want to be tucked in and the seam is on one side, and now looks like a little hood (b). Step 7a: On the door panel, take a tab and fold it in half so the stitched seams are on the sides. Place the raw edge of the tab, up to the raw edge of the tent panel. 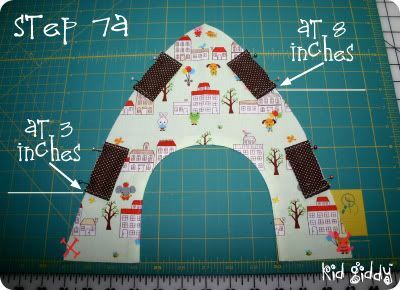 You will place two tabs at the 3 inch mark, and two tabs at the 8″ mark as shown in the photo. 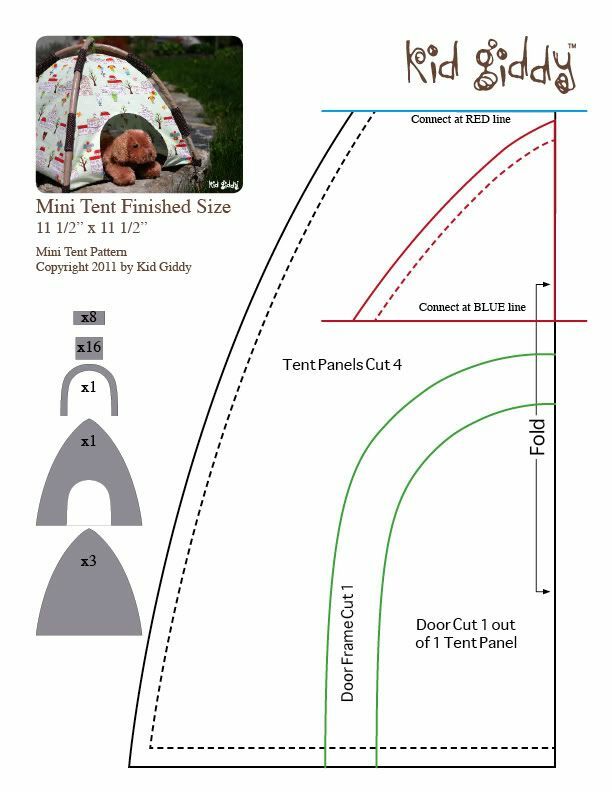 Step 7b: Place the corner tabs with the folded side down towards the bottom of the tent, and the opening facing the top of the tent, at the 5/8″ mark (note the red “X” marks in photo 7a). Step 7c: Repeat steps 7a and 7b on the rear panel of the tent. Step 8: Place one plain panel right side facing down, directly on top of the door panel. 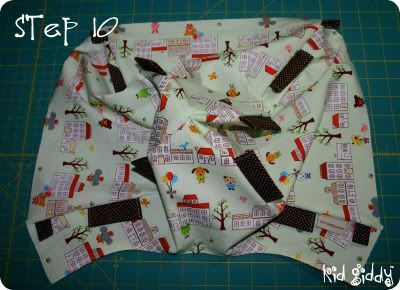 Sew only the right side seam from top to bottom, leaving 1/4″ open at the top for ribbon placement. Step 10: Place the read panel right side facing up and place the three-piece panel from Step 9, right side facing down. 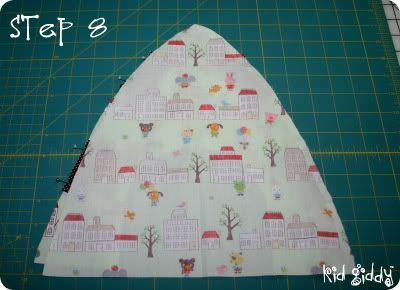 Line up one side and sew from top to bottom. You do not need to leave a 1/4″ open here. Repeat this step on the final edge of your tent and the top should now be complete, excluding the ribbon. Step 11: Place the flooring right side facing up on your table and pin the top of the tent to the flooring. 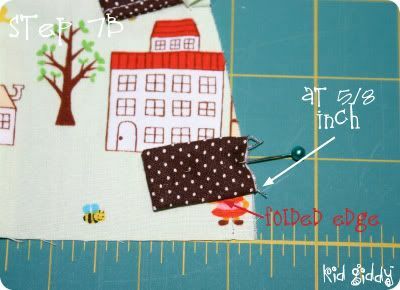 Carefully line up the corners and don’t pull or stretch your fabric. Step 12: Take the other flooring piece and place it right side facing down directly on top of the whole tent. Place two pins near your tent door opening, to allow for turning it inside out. Pin the flooring in place around the entire tent, making sure to keep the corner tabs out of the way. Step 13: Starting at one corner of the tent door opening, sew along the edge of the tent, all the way around to the other side of the tent door opening. Again, be sure your corner tabs have not been sewn into the seam! 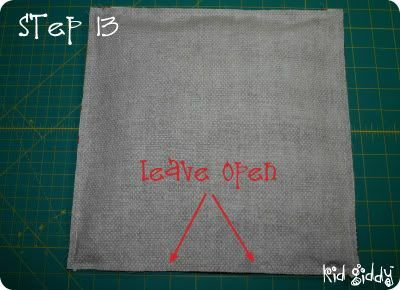 Step 14: Turn your tent inside out through the opening. 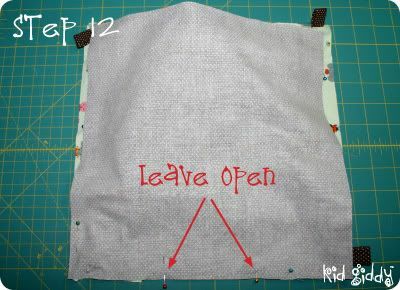 Press the opening if necessary, and top stitch this opening closed. 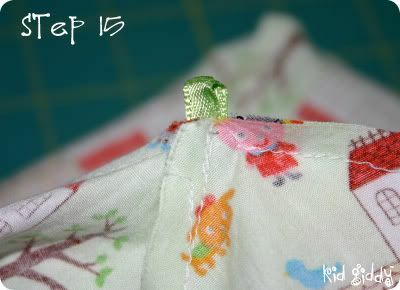 Step 15. 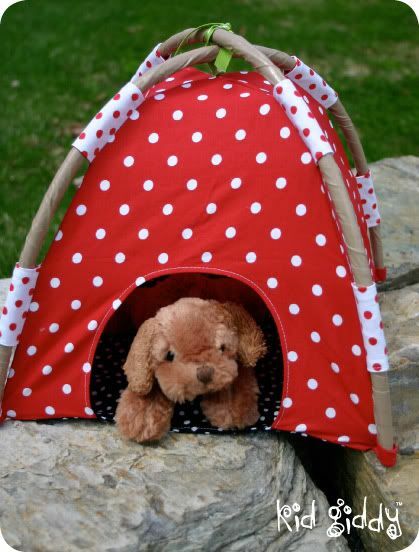 Turn the tent inside out and place a piece of ribbon folded in half, up into the tip of the tent. 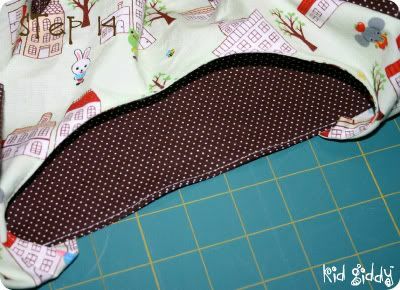 The ends should be hanging out of the top, while the folded edge is on the inside, stitch this seam to secure the ribbon. 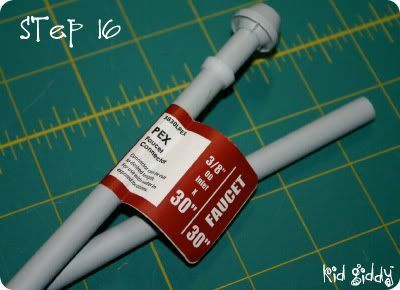 Step 16: CAREFULLY (adults only), trim your poles to size with a pocket knife or small blade (be sure to trim the end with the extra piece on it). One pole should be trimmed to 28″ and the other should be slightly shorter, about 27 1/2″. (One pole will sit under the other). You can cover up any printing on the poles or match them to your fabric by using duct tape. I used brown to make them look like twigs. Start at one end and twist the pole while holding the tape, and gently work your way up. Do not over wrap or the pole will not fit in through the tabs. Step 17: Place both poles in through their tabs. Step 18: Place two ends into their corner tabs. Then gently bend the poles to insert the opposite ends into their corner tabs. Step 19: (not pictured) Tie the ribbon up around the two poles and you are finished. I have some more REALLY exciting news coming in the next couple of weeks - but until then, I've got some thumb cover orders to sew up and ship out to customers that have been patiently waiting while I worked on the previously mentioned exciting news! If you are new to my blog, stay a while, have a look around and enjoy! I hope you find something yummy to whip up or fun to make for yourselves! And I hope you'll click the follow button for even more exciting things to come later this year! If you are not so new to my blog - welcome back and thanks again for stopping in! Talk to you all soon!